I try not to complain too much around here because this website is my happy space. It’s how I pay the rent, which is a very happy thing and I can do the things I love, also a very happy thing. So you may or may not know that I have a wonky right hand. And guess what? My right hand is my dominant hand… the one I crochet with and stitch with and do just about everything with. When I was about 12 I ran into a wall playing sock hockey on a recently waxed and very slick gym floor. That crushing cinder block gymnasium broke bones in my thumb and gave me one nasty goose egg and concussion. I actually broke my growing plate and my thumb hasn’t grown since I was in the sixth grade because of this. If I put them side by side I have one 12 year-old sized thumb next to one 30-something sized thumb and there’s about an inch of difference. It’s kind of weird! I started to get arthritis in my right hand early in high school and I was beyond mortified. Arthritis was for old people and I was barely a freshman! The horror, the shame! Then as an early thirty-something I manage to lose my right pinky finger because I stuck my hand in the middle of a dog fight trying to break things up. Long story short, that was a BAD decision. My pinkie hanging against the back of my hand for several hours before I made it to the hospital meant that once reattached there were some serious issues. With the tendon severed and hand surgery fairly unsuccessful I now have a pinkie finger that doesn’t really function. During the doggie melee I also injured the palm of my hand and my ring finger. Now, several years later the arthritis can cause blinding pain when I use my hands. And guess what? I constantly use my hands! Not only because of this website but because I can hardly stand to have my hands stay still. It’s just not in my nature to sit idly around. 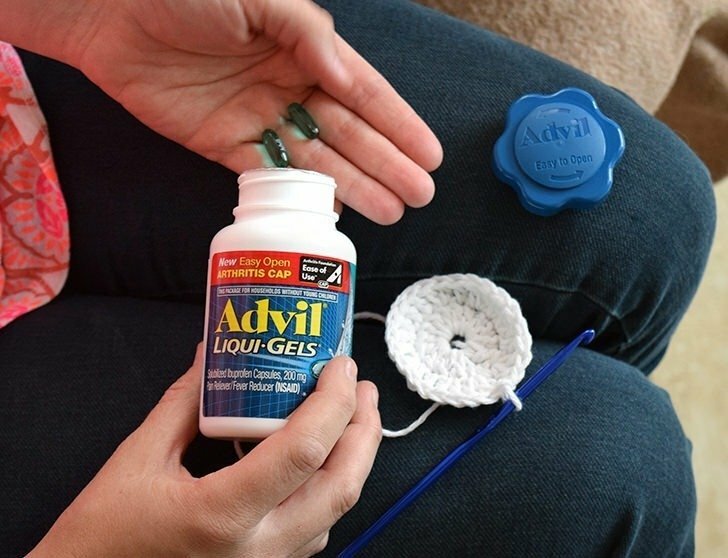 I literally always have a little vial of Advil in my purse to help when my arthritis gets to the point that I need a little bit of help to get through my project. 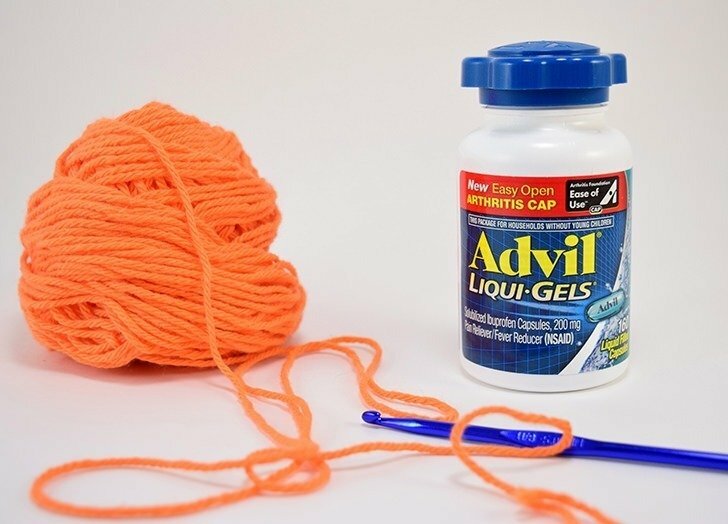 As far as I am concerned Advil is the best OTC pain reliever to help me through my arthritic moments. And it turns out my personal feelings are totally on point as nothing’s proven stronger than Advil for minor arthritis pain. 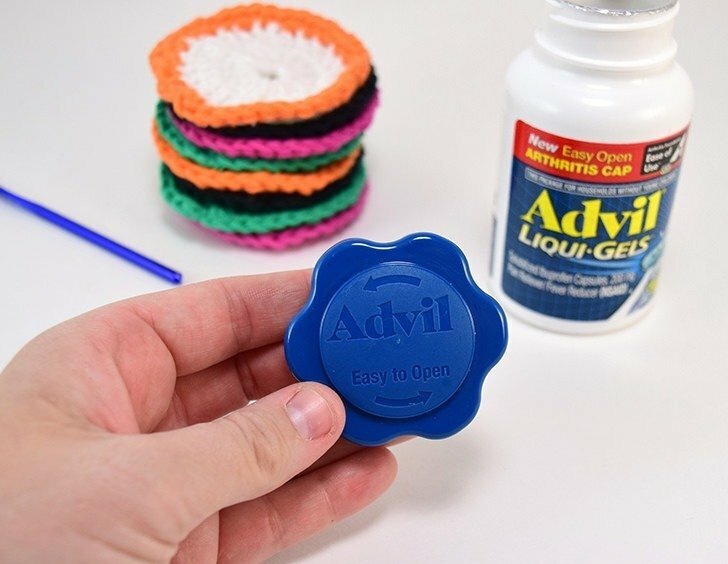 So when I heard about the EZ open cap at Walmart I was pretty excited about the idea and I totally wanted in on that business because when I’m reaching for the Advil it’s because my hand hurts and sometimes opening a bottle of medicine straight up won’t work out. Like I carry that business in for Rob or my dad to open for me. But this new lid is ah-mazing. 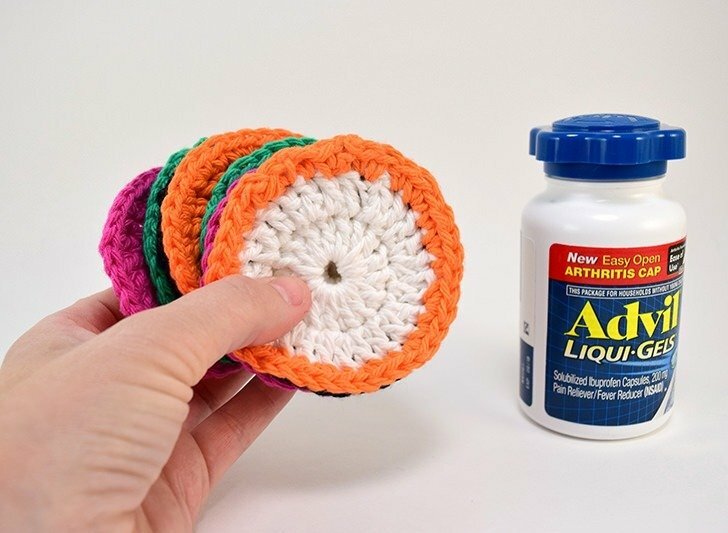 I crocheted a ton of these little cotton rounds up and when things started to get stiff and achy in my joints I was able to easily open that bottle up and get the relief I needed to get back at it. 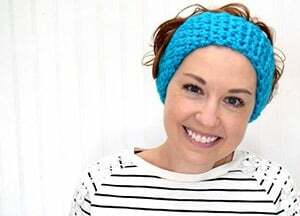 You’ll need to grab a crochet hook in a size that you are comfortable with. H/8 is currently my crochet jam and I might suggest g-i, but in truth just about any size will work for this particular crochet project. 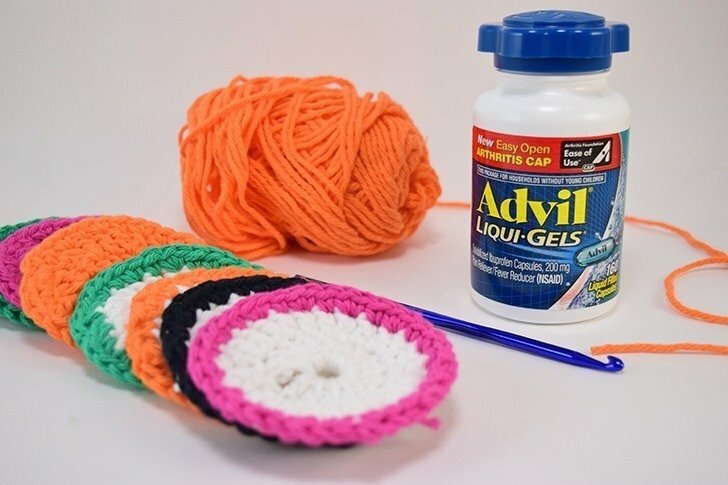 The next thing you need is cotton yarn. 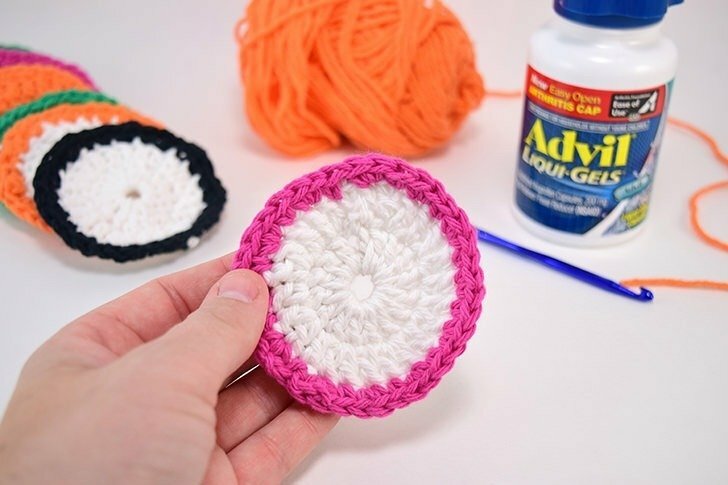 Don’t buy acrylic, wool, or any blend of anything… the rounds you buy to clean your face with at the store are made out of cotton for a reason. 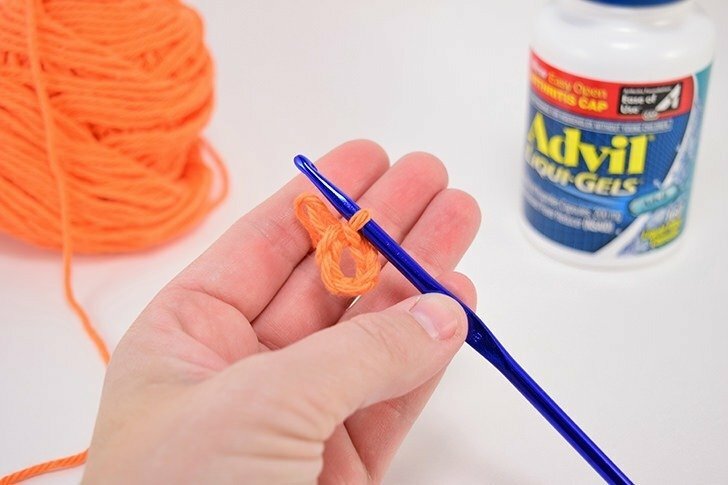 Insert your hook into the first chain and slip stitch to turn your straight chain into a round loop. Grab a hold of your tail and chain 3 times. 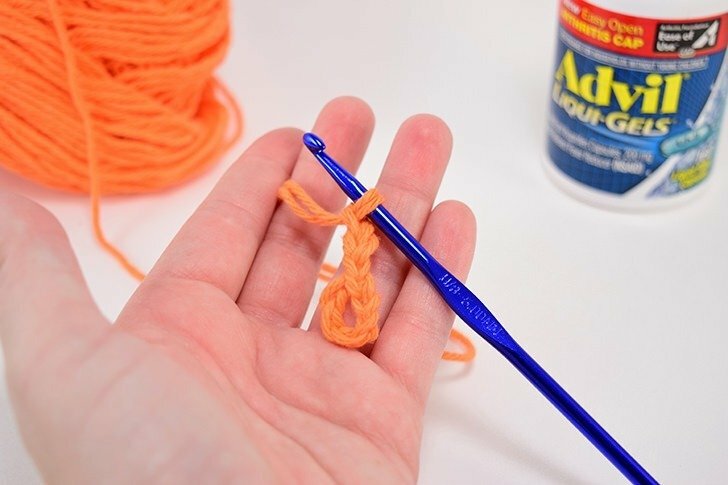 This will act as your first double crochet and helps to weave in your ends without a lot of fuss. Going in through the center of the loop make 15 double crochet stitches. 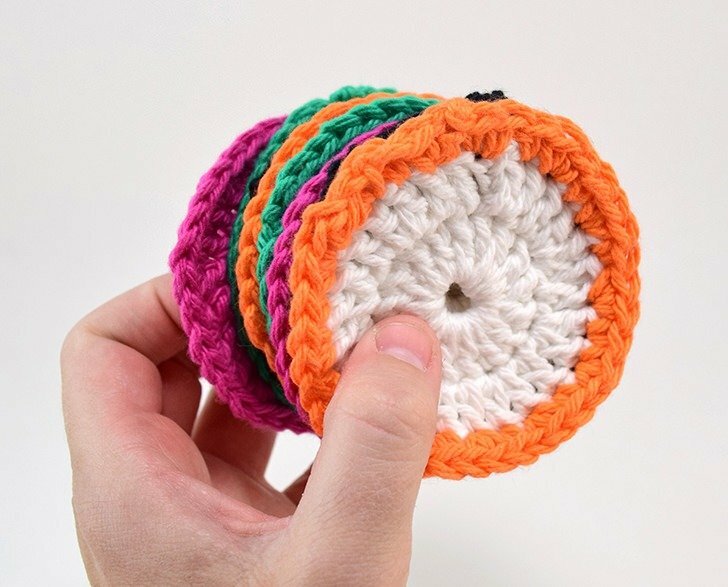 In the end you’ll have 16 spokes total when you include your chain of 3 that acts as your first double crochet. Slip stitch in the chain of 3 to close the round. Chain 3. 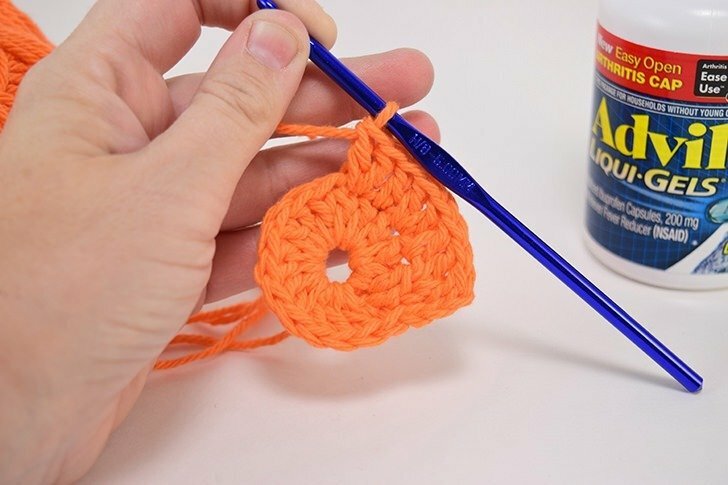 This will act as your first double crochet. 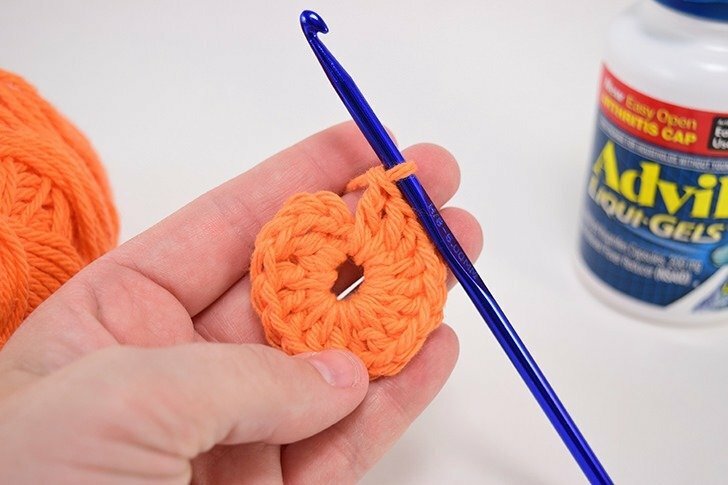 Going around the outside of your first circle you’ll alternate 2 double crochet stitches in one space followed by a single double crochet in the next space. This will continue the full length of the round. 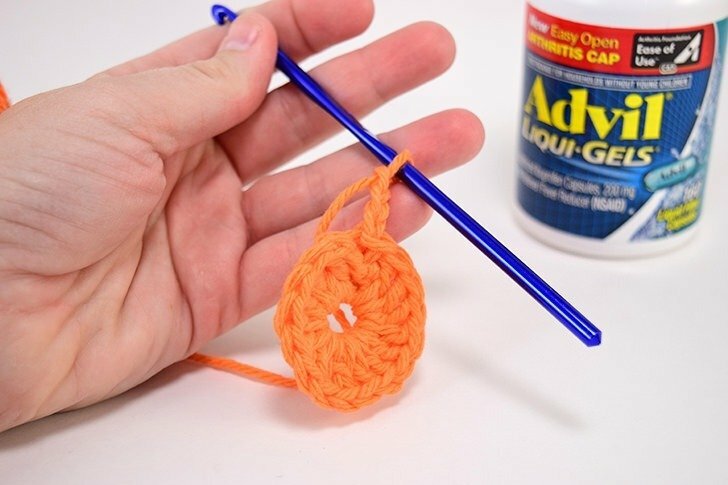 Alternating 1 and 2 stitches helps your round grow proportionately. 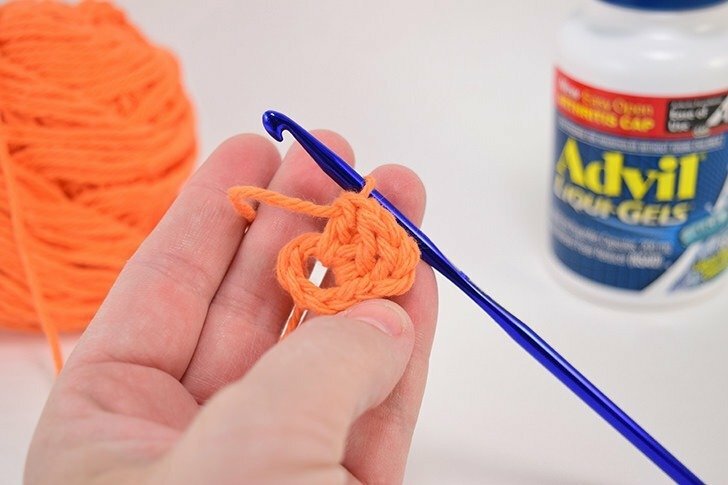 Close up the round with a slip stitch into your chain of 3. 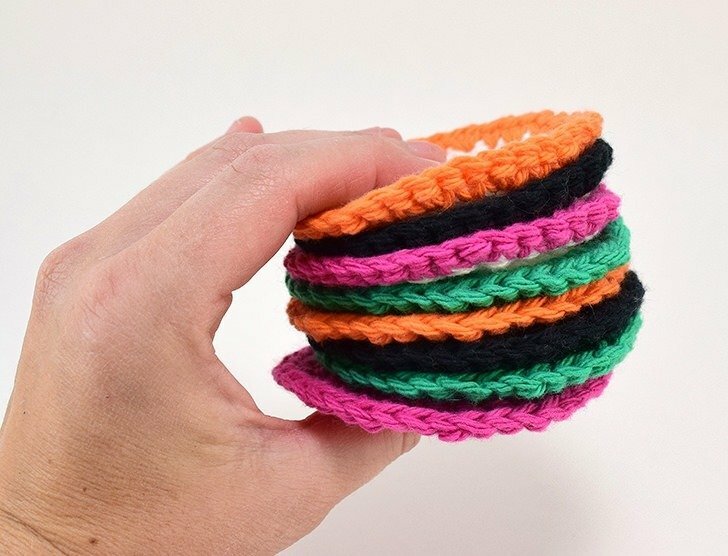 Next you’ll chain 2 and single crochet down the line in the same format as before. 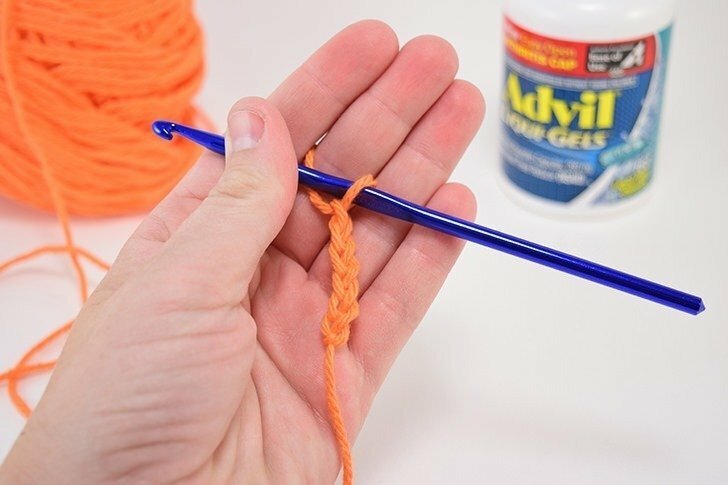 Stitch twice into the first chain from the hook and once following in the next, repeating the 2 stitches in one and 1 stitch in the next around the length. 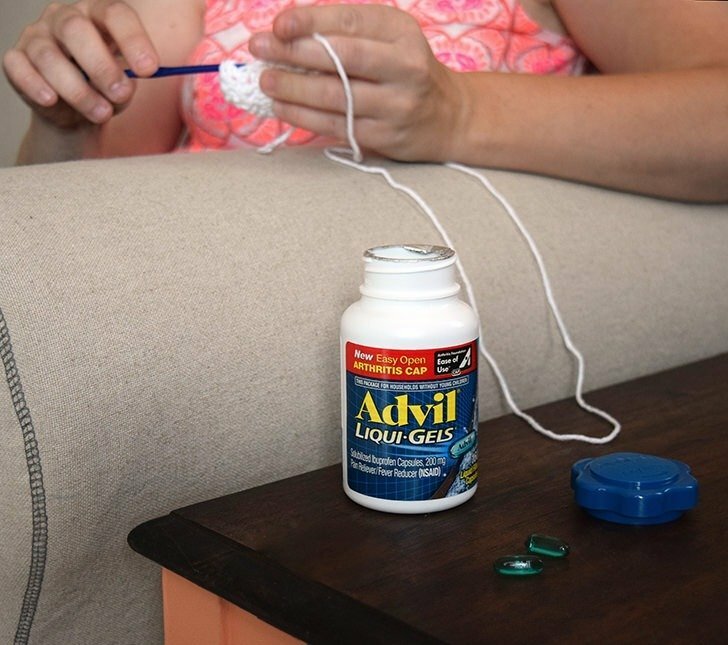 A slip stitch at the end will finish up the round. Weave in any ends that are left behind to finish. 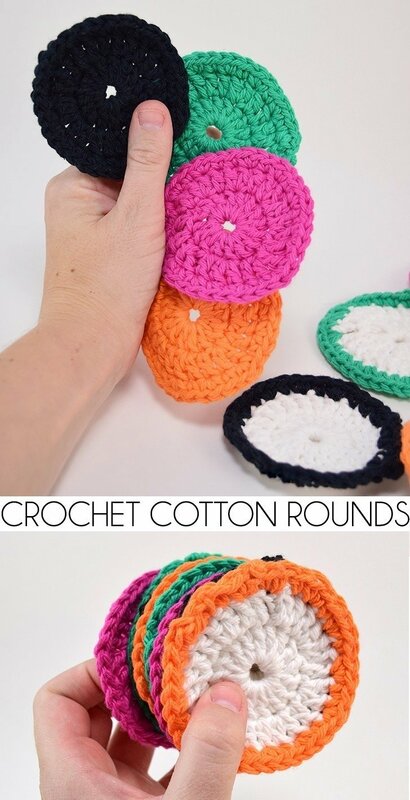 Now I wanted to make at least 7 crochet cotton rounds so I’d have a clean one to wash my face with every night. I might actually crochet a few more so I have one for the morning and another for the evening. …and for a bit of fun I stitched the double crochets with white and the final round of single crochets in one of my colors for a fun pop! 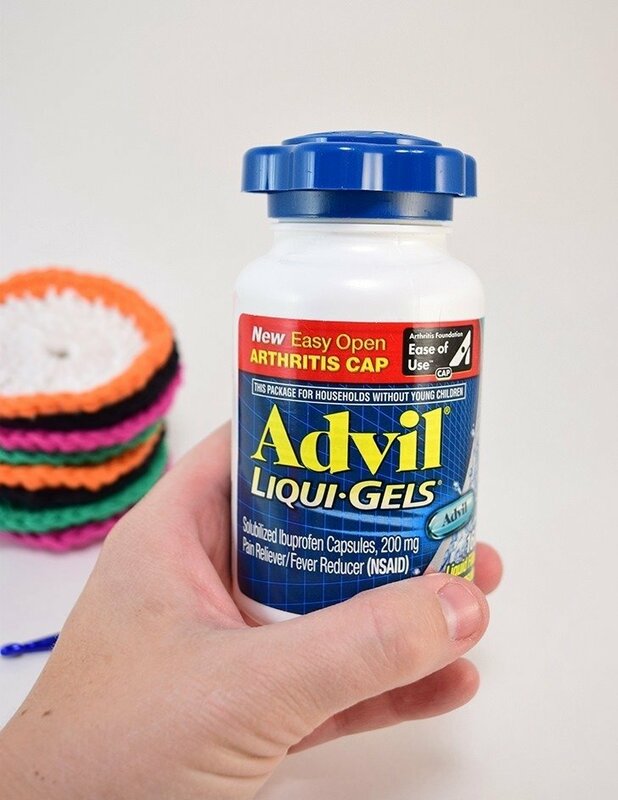 I am already a HUGE fan of the new lid on my Advil and this is the bottle I’ll always purchase in the future. 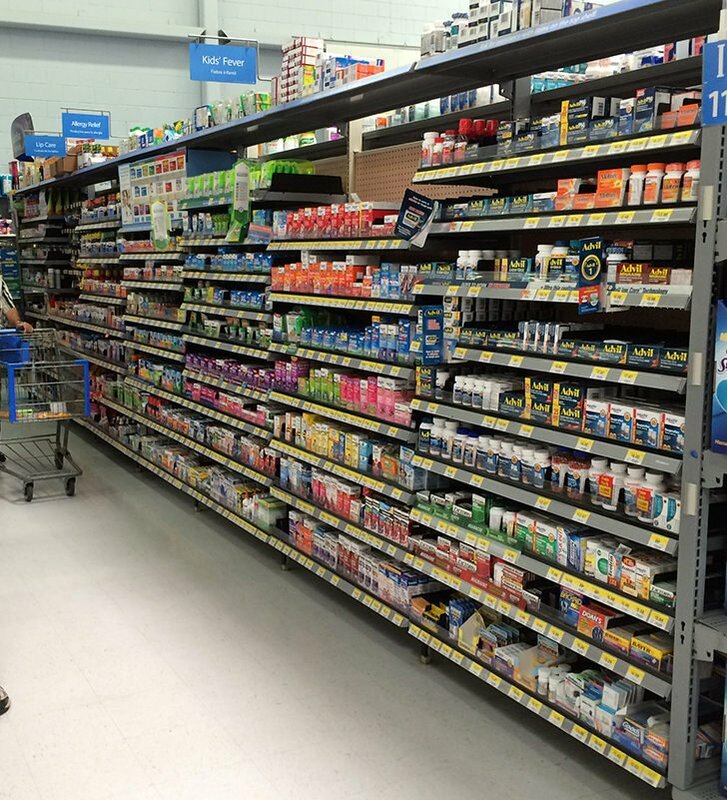 After all, I was able to keep on going all because I grabbed my new bottle of EZ Open Advil at Walmart. To learn more about how you can live your life the way you want to with arthritis I’d like to urge you to check out this Better Living Toolkit. We may not have a choice about whether or not we have to live with Arthritis but we do have a choice about how we handle it in the end. 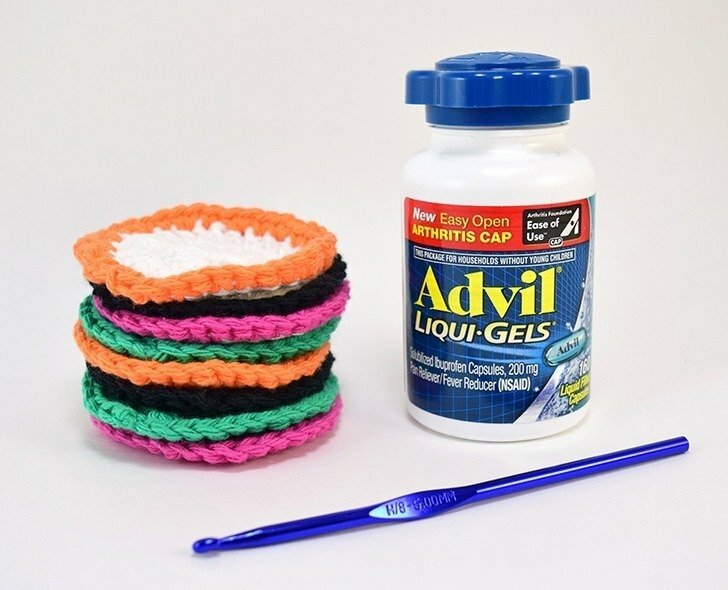 And in the end, I choose to deal with it with the help of Advil and keep on making things! Never thought of making face scrubs, THANK YOU for the idea. 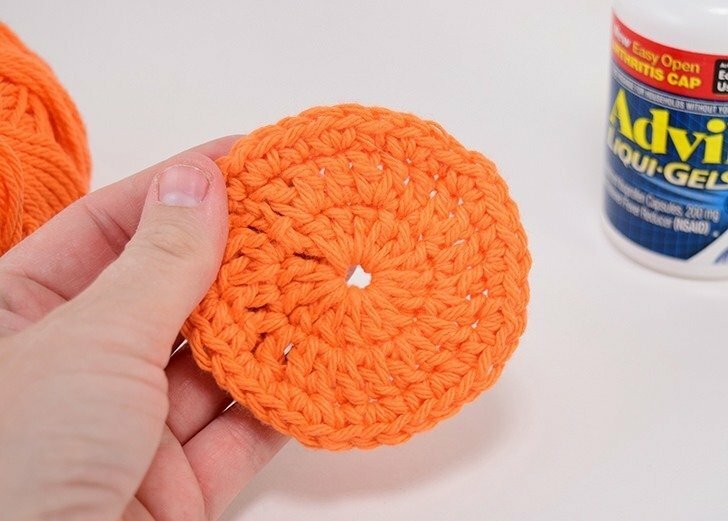 What do you do with all those round circle ? I use them to wash my face and I replace disposable cotton rounds that I use for toner after washing my face. You are admirable. I also have ongoing issues with arthritis and at this point, I can’t take anything for it due to other health issues and Advil gives me stomach ulcers if taken in that quantity. But like you, I must keep active. I may be slower but I still get things done. Keep on,keeping on.